After almost 2 months and 6 Qualifiers we finally have the full SC2Improve Winter League 2013/2014 Round of 16 line-up and it is STACKED (some say it is almost like Code S, but that may be more because of the number of Terrans). Never before have we seen so many amazing players in the RO16. This is going to be an SC2Improve event you need to make sure you do not miss! The dates for groups will be announced next week. What a group to start things off with - 3 WCS level players, two of which have played very highly in the SC2Improve Summer League. The group starts with Tefel vs Noname. Noname won the SC2Improve Summer League, a tournament in which Tefel dropped out in the semi-finals to JonnyREcco. Knowing Noname's heavily macro-orientated style of play and Tefel's interest in Roach/Hydralisk aggression this should make for a fantastic TvZ. Arthur vs Levi is the second match. Arthur currently resides in WCS NA Premier League, whereas Levi is pretty unknown. Everyone will be expecting the new ESC player Arthur to advance to the winner's match here, but it's PvP and upsets always happen in PvP. It's sort of ridiculous to think that one of Tefel, Arthur and Noname will leave us in the RO16 of the tournament, but that's just how ridiculously stacked the tournament has become. In Group B we begin to see more of the Korean invasion. We begin with uThermal against TomikuS - another TvZ. This could go either way - although uThermal is the more well known player, recently dropping out of WCS Challenger league to Snute, TomikuS has taken down a lot of great players with his hyper-aggressive play style to get this far and I doubt he will stop now. To follow up the TvZ we have another PvP - this time between Patience and Tassadar. Patience will be the favorite going into this, as living in the Alien Invasion team house in Germany will remove the latency factor which affects Koreans. Tassadar, a recent recruit to Love Your Girlfriend, has been extremely under the radar apart from in online cups. Time to see what he is made of! 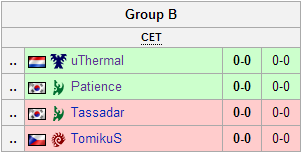 The most exciting part about this group is that any of these players could make it through to the RO8. TomikuS defeated Tassadar just yesterday in the Qualifier #6 semi-finals, but can he and uThermal overcome both of the Korean Protoss? The Korean invasion becomes even stronger in Group C. Not only are there 3 Korean players, but two of them are part of Samsung Galaxy, a team which only narrowly missed making it to the Round 1 Playoff Finals in Proleague. Now consider that one of these guys has come out as the ace for the team multiple times and won against the best players in the world. Now you realise why we are on the next level of sickness in the Winter League this year. Armani takes on SeleCT in ANOTHER TvZ (I swear down this wasn't fixed) to start the Group off. SeleCT's drop heavy style is extremely exciting to watch, but we'll just have to wait and see what Armani will bring to the table. Solar takes on Pink in the second match and while I would love to see Pink do well, I can't help but feel he has fallen extremely unfortunately into this Group. On the bright side, at least one Korean is going to drop out in the RO16 for definite! Group D brings us a group of no Korean players! It also brings us the defending SC2Improve Winter League champion Adonminus, seeking to defend his title and win the tournament for the second year in a row. He plays in the starting match against JonnyREcco who has been continuously improving since the release of Heart of the Swarm. This should be an extremely exciting PvZ as Adonminus never makes for a standard game. DIMAGA vs Sjaak is our second starting match. Sjaak gave us one of the best RO16 groups we had ever seen in an SC2Improve tournament in the Summer League, where he nearly beat JonnyREcco in the first match before losing to Lucky to fail to advance. He did show us great games though and hopefully we see more of the same against fan favorite DIMAGA. After seeing these groups written down it is still hard to believe that this is just an SC2Improve event. But it is what it is and I am RIDICULOUSLY excited to see how this all unfolds and to bring you all the action on stream. I'm also slightly scared, because once this is all over how on earth am I supposed to produce an even better tournament for the Summer League this year? !